That about sums up how I am feeling today, less than 5 hours after I completed what I have secretly nicknamed “The Santa Obstacle Course 2018”. When I realised I had finished it, a huge weight lifted from my shoulders, and I felt like dancing. But I still had two hours more work to do, stocktaking our little area, tidying up because my offsider is a bit of a hurricane at times and also forgets to put things back where they live, cleaning, sorting, fixing. After that I caught a lift home, made coffee, cleaned some in preparation for tomorrow – we are hosting Christmas – snuck out for a quick take away dinner, had afternoon coffee at the late hour of 7pm, cleaned a little more, and I still have a bit more cleaning to do. I had no idea it was possible to be this tired. I’m ready for sleep already. It isn’t physically tired, though there is some of that. I’ve been getting my 10000 steps every single work day these past weeks. I’ve actually kicked the chair out of my area because I don’t have time to sit and I don’t have room for the chair. It is 90% mentally tired and part of it is Aspie tired. You see, usually at any given time in my job, I might have 20-50 items with various names on them, waiting for the customer to pick them up. All of that is mentally catalogued via my Aspie Super Powers, filed away neatly in my brain. When the customer arrives, I ask for the surname, and it takes me mere moments for my mental file system to tell me exactly where that item is. Over the past 5 weeks, I have had double to triple the amount of items with various names on them. I’ve also had 200 or so extra items with names each week to catalogue. I’m not the only person working there, either. I’ve had to create “maps” of where everything is, so the other folks can find things fast when they need to. That plan seems to have worked really well. Christmas Earrings, Christmas T-shirts, a good Christmas “stocking cap”, and Christmas Nails have been my work uniform recently. This sequinned version from Spotlight was not the one I chose but it was up there in the top three options. 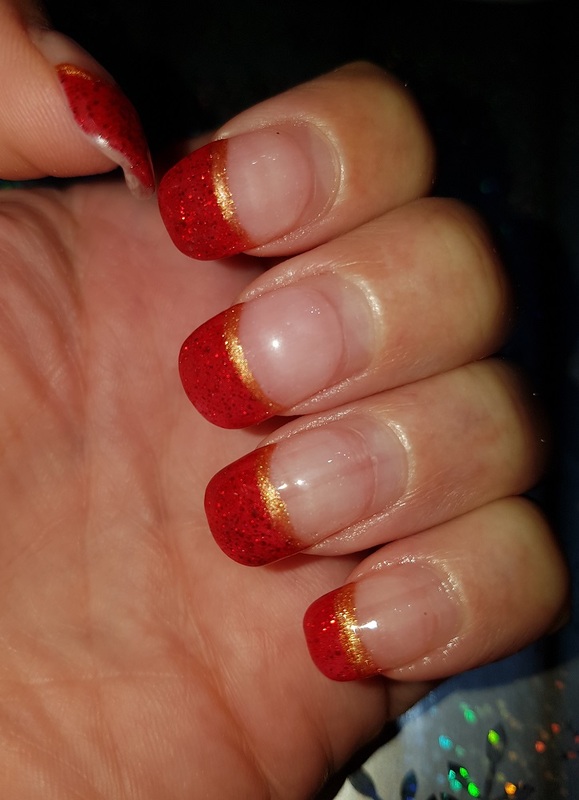 My first set of Christmas Nails were done on November the 21st. This is exactly what I saw in my mind though the gold line might have been more solid gold. I asked her to exaggerate the tips, make them larger/taller than usual because I knew it would be 3 weeks before I could go back. 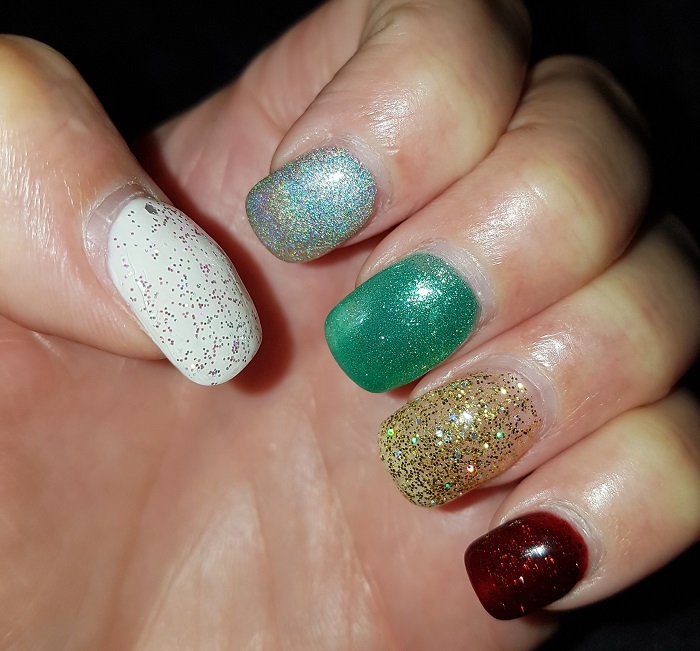 My second set I’m thinking will have 5 different shades of glitter – green, gold, red, silver, and sparkly white like snow. If these nails could talk, the stories they would tell you of the past few weeks! The checklists of “things that must be done before Santa sits in the chair”. The time I missed one of the vital steps and thus set off the fire alarm as a surprise to everyone. You can bet I’ll not make that mistake a second time. The screaming children. The happy children. The screaming parents. The happy parents. The levels of skill of our photographer who is able with just a few words to get children to sit up straight and smile. You can visibly see them follow his instructions, and every single time it amazes me. The outfits worn by families to see Santa are generally of a sparkly, sequin covered and often tulle-skirted nature. I wanted a tulle skirt for me. 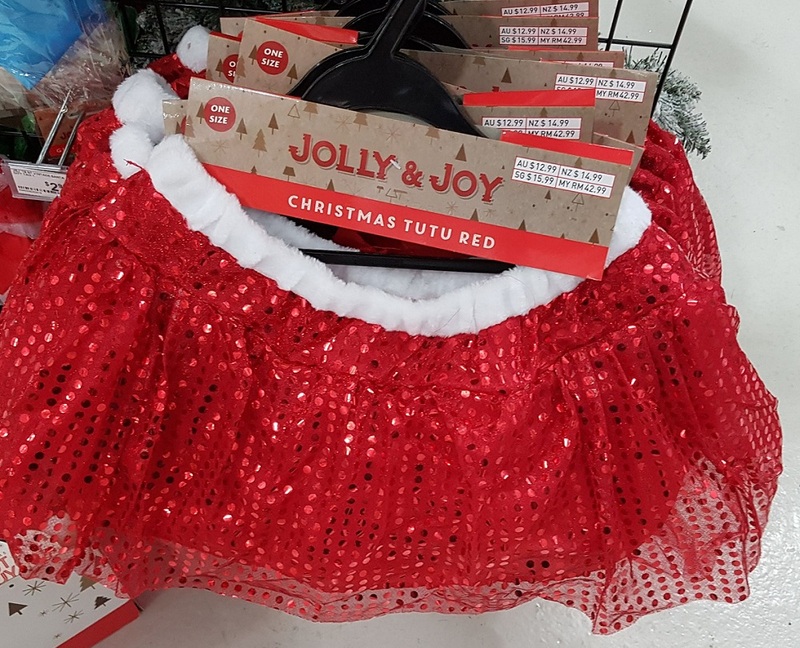 I did nearly buy this tutu, also from Spotlight, but decided it would be a step too far. Three weeks in, I actually think I was wrong on this particular call. It would have fit right in. Anything you can do to get smiles out of the folks or divert the attention of a crying child is worth ten times the $$$ you pay for it. 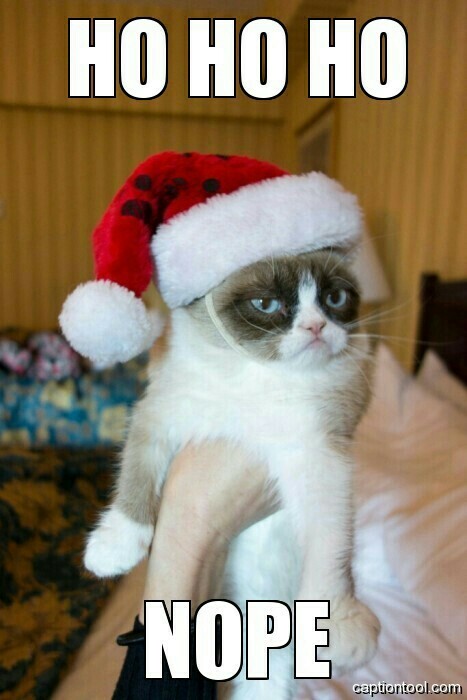 Next year, especially if I can snag it on clearance prices after Christmas. That is why this toy was an incredible godsend. 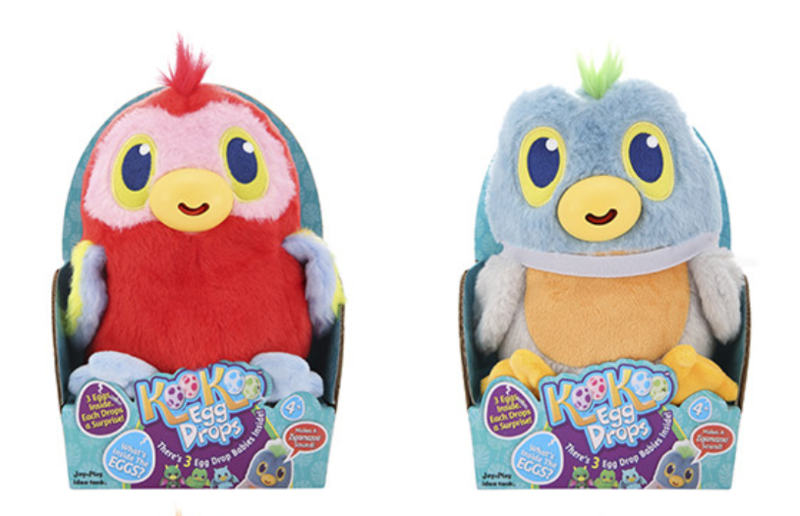 I am not hip to the latest in toys, it has been a few years since I needed to buy any, but the how to survive Santa info pack was clear – get a toy that makes noise so the photographer can get the attention of the younger ones and they will look towards the camera. When you squeeze the head of this toy, it makes a loud funny noise that never fails to get *me* to laugh, and it always works with the kids. One young gentleman appeared wearing this t-shirt. I LOVE THIS. I love everything about it, especially the silver foil text and the font they used. I loved it so much I had to ask where they got it. 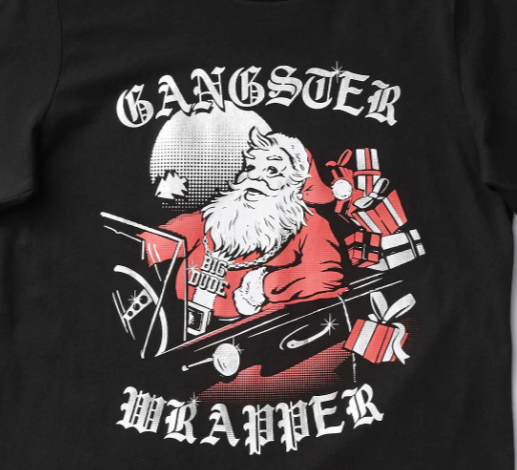 You too can purchase Gangster Wrapper at Target. 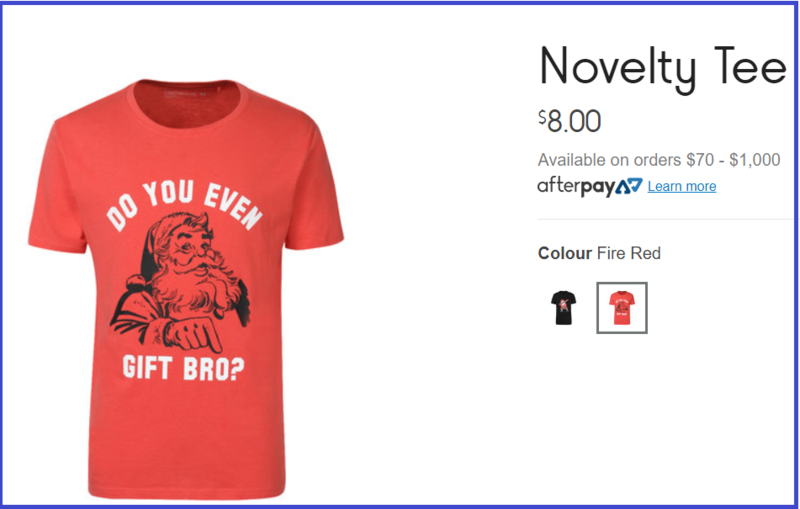 Sadly it is not available in my size but you can bet if it were, I would have ordered it on the spot for next weeks Christmas T-shirts. This one I found quite hilarious and it appeared in my queue of people at the exact moment I needed that laugh to get me back to the happy jolly frame of mind required. 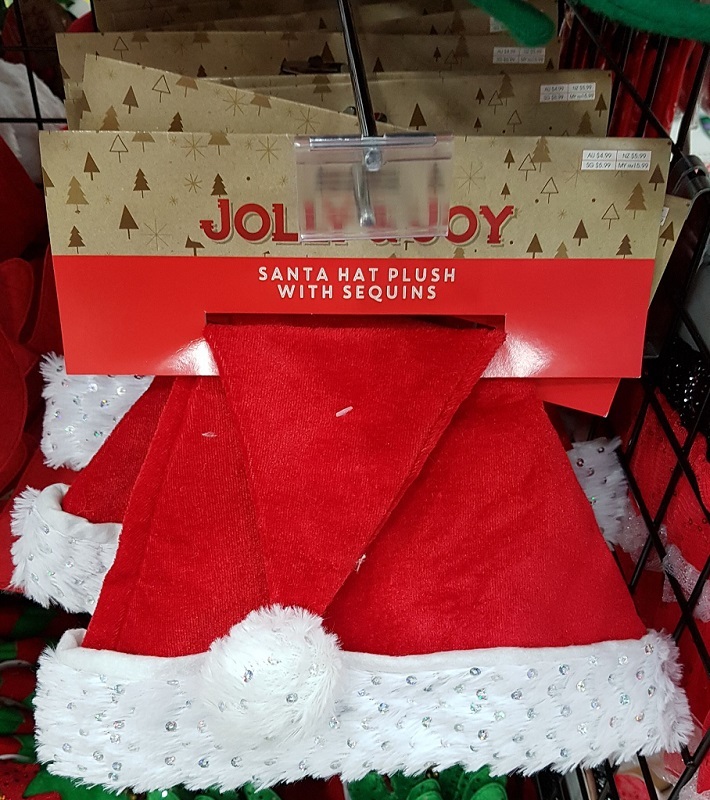 This one is just $8 at Kmart. 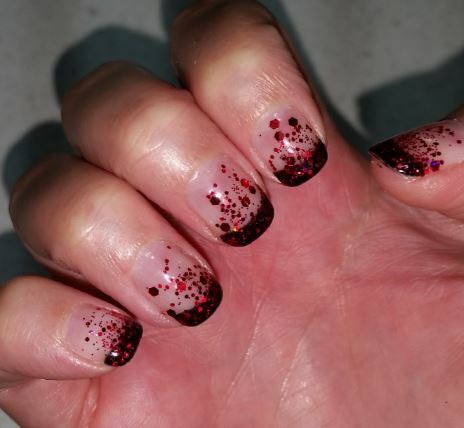 Just over three weeks later, my ready to be replaced Christmas nails were super long but still almost perfect. I’ve been having the Dip Nails AKA SNS done since March now and I am a believer. These babies never let me down, and I am constantly surprised at how strong they are. Some of the tasks I have to do are not particularly nail friendly but it has been months since I had so much as a crack appear, let alone any kind of breakage. I think a mix of things = why these nails work better for me now. 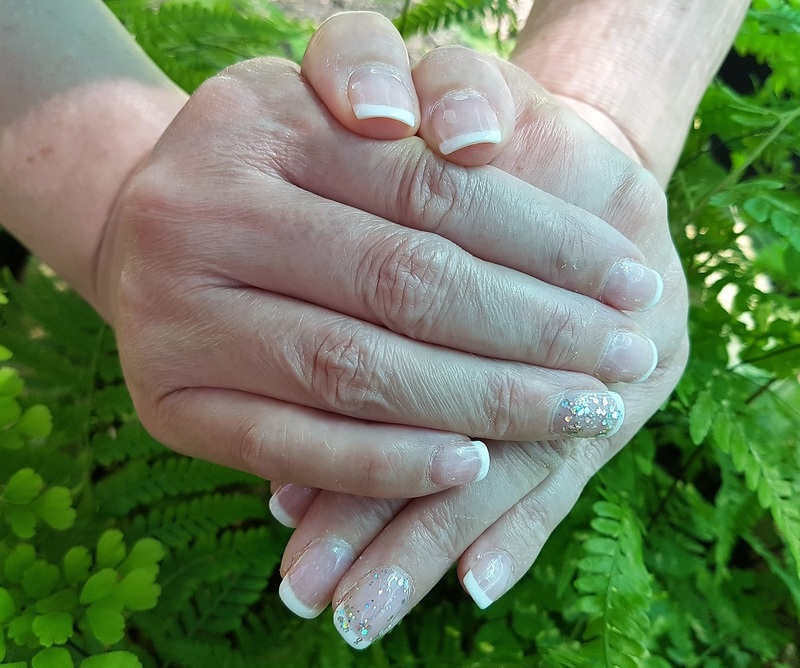 The nail artists have just got better and better at the SNS procedure, I started having them done right when they started learning how to do it and I believe that is what led to the occasional problem. I have also learned what tasks are likely to spell trouble – eg opening a box – and I am a lot more careful when doing those tasks. 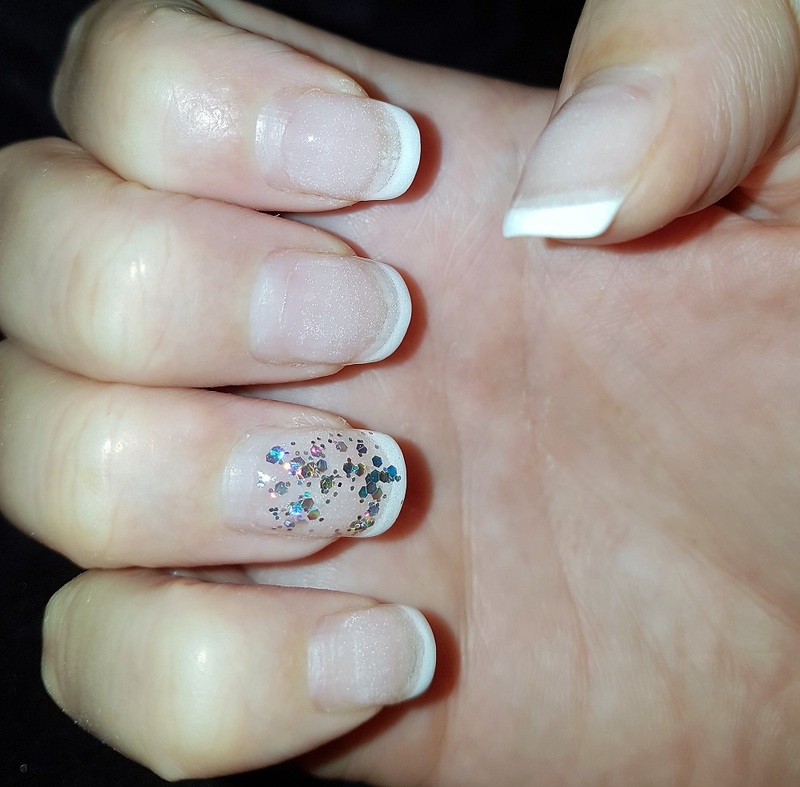 On Wednesday the 28th of March I got my first set of dip nails, also known as SNS nails. It was an interesting experience. This is an acrylic powder which bonds to the nail. It is not acrylic nails as you know them, though. 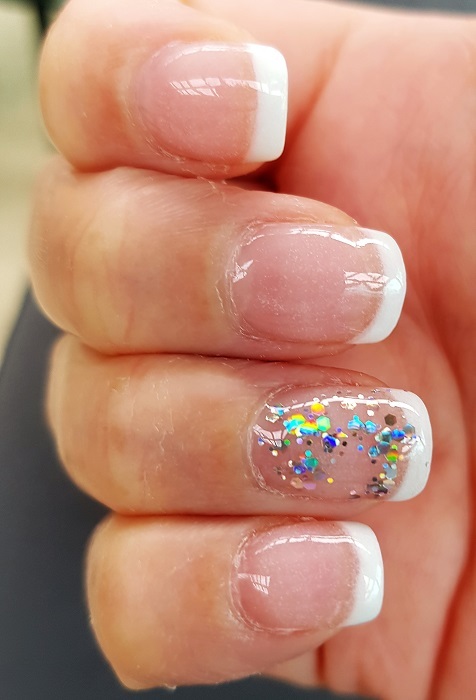 They feel a lot lighter and you don’t do infills, the powder is removed and completely replaced on your next visit, similar to how gel nails are removed. First of all the manicure overall is less “invasive” – they do not do all the filing, buffing and cuticle paring they normally would. This may be better for the natural nails underneath long term. 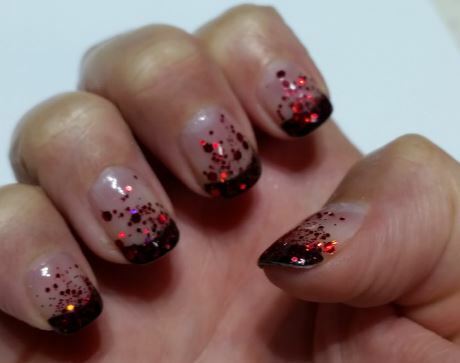 After the previous nail polish is removed, a base coat is put on but not your normal base coat, then the nails are dipped into a container full of powder. Surprisingly the powder does not stick to the finger, just to the nails. The finger is tapped gently to remove excess powder. The powder may be coloured and even in some cases sparkly. Because I chose to have french tips, the white you see here is also powder in a different colour. Only the tips of the nail are dipped in the white powder. Underneath the powder are my own natural nails. 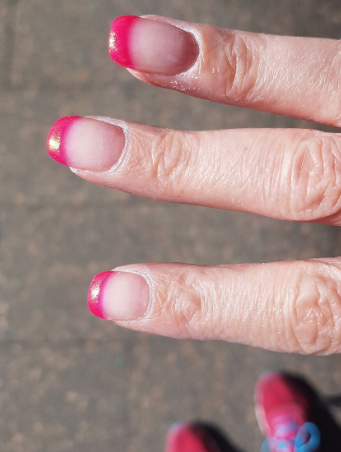 Thursday 29th – After 24 hours – My nails are a LOT stronger with dip powder on them. 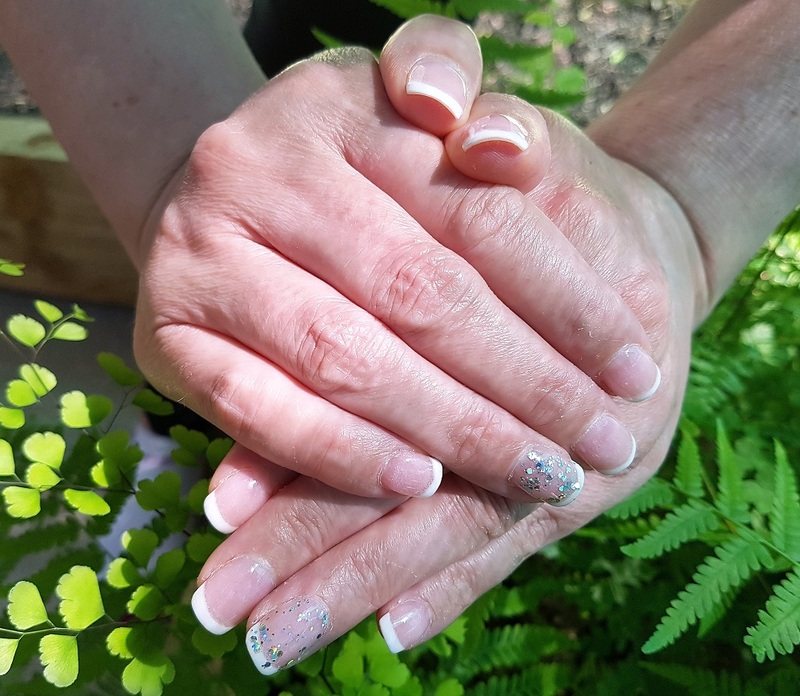 Over time having gel nails I have identified times of the day where I have to be more careful – number one being after getting out of the shower. 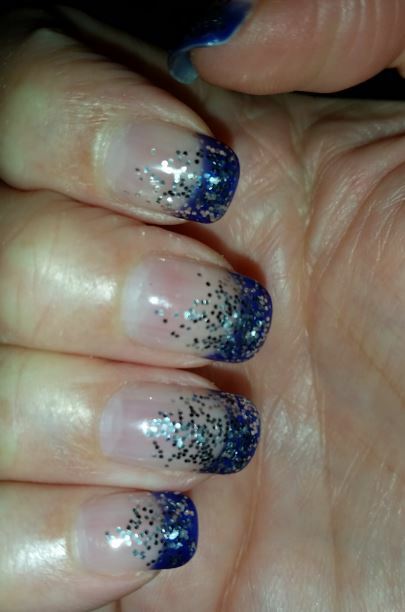 Time in the water does tend to soften both my real nails and the gel polish. That is not the case for dip nails. 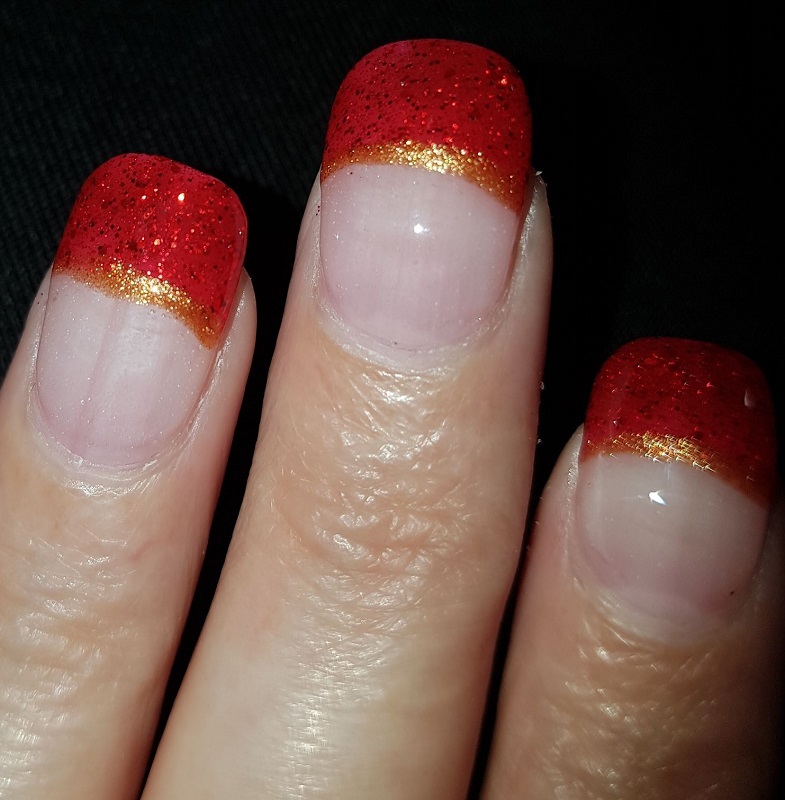 Saturday 31st – I am loving this manicure. The one possible downside is if you look very closely you can see dots in the clear area of the nails – so you can actually see the powder. But that is far outweighed by the strength of the nails. On Sunday the 1st of April planned life changed somewhat with the illness of BeeGee. This actually changed how I live life for the next two weeks. Anytime I touched the chicken, there was a handwashing. I’m a bit more handwashing orientated than your normal person but even I do not usually wash my hands several times an hour unless I am cooking. 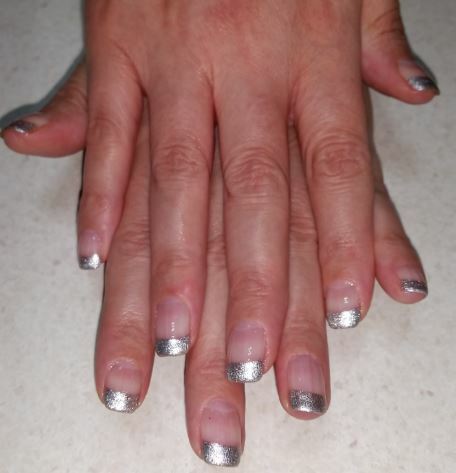 Dip nails may work great for people who have their hands in water a lot. I thought this would be an excellent test of the dip nails and I was right. The best thing about them – during the BeeGee time, I did not even have to think about them, or be concerned that I would break one. I did not baby them at all like I usually might with a normal gel manicure. They grow out just like the normal gel nails do. This pic is the day before I got them redone, so you can see the gap of regular nail between the dip manicure and the cuticle. This photo does show the dots a little bit better than the previous pic too. You can also see that the white tips have grown out and you can see the normal nail underneath. When we usually do a french tip manicure, my nail artist will paint the tips artificially a lot lower than they really are, so as the nail grows out you don’t see as much of the normal nail underneath. I did manage to crack one approximately two weeks into the mani but unlike a regular manicure, this did not mean I had to run off and get it fixed right away. 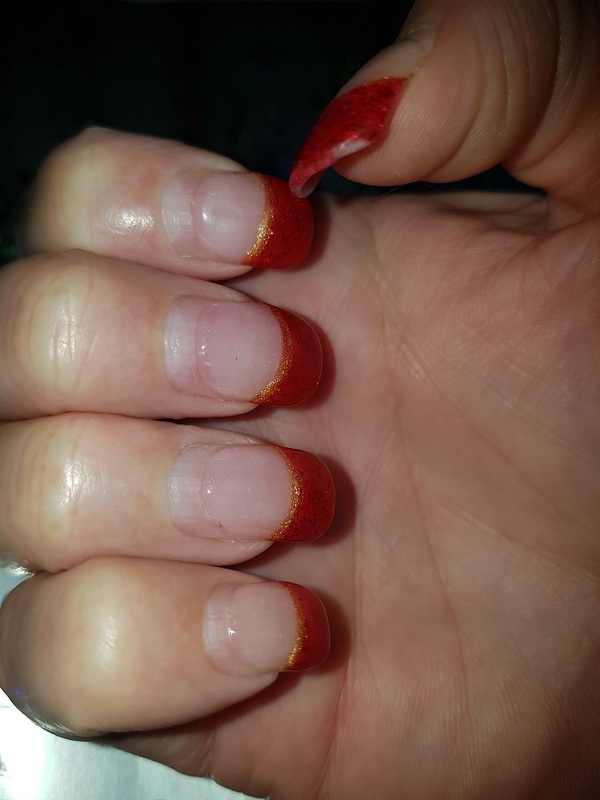 It was only the dip coating that I cracked and not the nail underneath, and the crack did not seem to have any effect on the strength of the nail at all..
After this great experience I decided to get another dip manicure and this time I decided to keep all the length my nails had grown in the past 3 weeks. 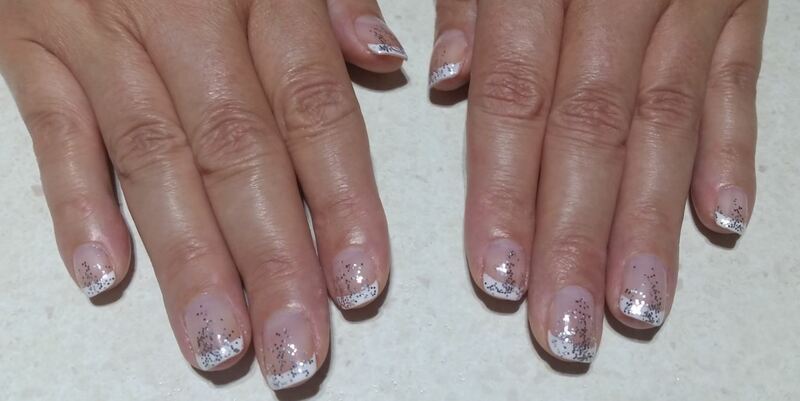 Removal is done exactly the same way as gel nails – cotton wool soaked in nail polish remover is placed on top of the nail and aluminium foil placed over the top. I found that the powder comes off a lot easier than the gel does, so there is a lot less grinding and scraping. Two days after having this done I am still on the fence about whether the length is a good decision for me. A week after having this done I am having some trouble doing some things with this length of nail. 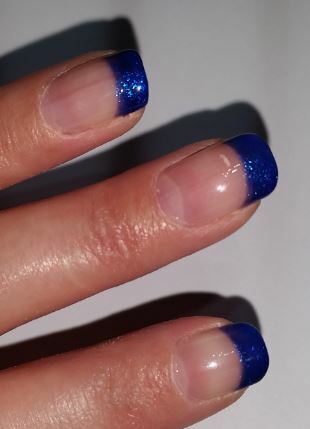 I’m worried I might not get my full 3-4 weeks out of this manicure due to the length – lesson learned for next time. I am not especially worried that I will break one – dip nails are pretty incredible strength wise. I’m starting to wonder if it is possible to break them. I think if it could be done I would have managed it by now. I am wondering if one may be more likely to rip ones own nail out of the nail bed rather than break one of these. 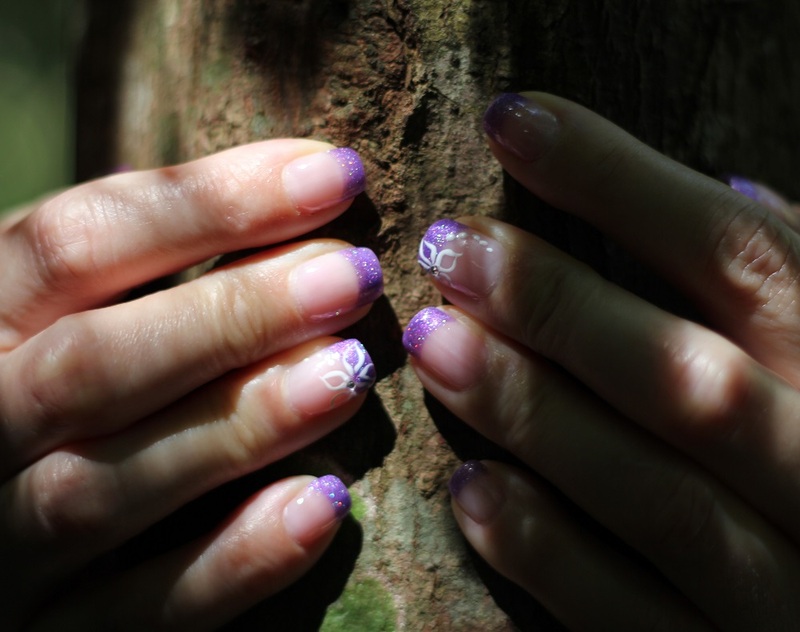 A recent manicure photographed at Minnamurra Rainforest. My nail artist was not feeling the best when I visited her to get this manicure. I could tell from the moment she touched me that she was running a fever. But she also had a shop full of somewhat impatient people trying to get their nails done all at once and she was trying to get out on time this particular day. She knows I am patient and willing to wait but not everyone else is. I did not notice until she had finished the small error that she made. Can you see it? It does not bother me at all, because this is my favourite nail colour.. This purple has holographic glitter throughout, which reflects back a rainbow of colours in certain lighting. I’ve had it as french tips a few times now and if in doubt about which colour to pick, I choose it. She saw it, frowned and immediately offered to redo her work, I said heck no, you want to get out on time and it does not matter. I know it bothered her because she is a perfectionist. But sometimes it is worth living with imperfection. :) I won’t send her these photos. I know it would drive her up the wall. You can see more of her work here. 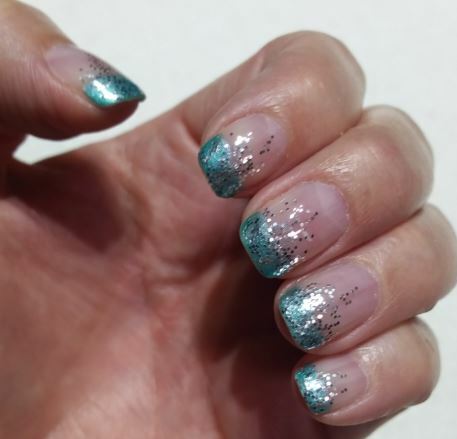 I’ve been getting gel manicures since late 2016 now, and I have learned a few things along the way. In particular what tends to damage or scratch the gel, and how to avoid breaking a nail. I know when to be extra careful, like loading and unloading the dishwasher and washing machine, opening boxes, that kind of thing. 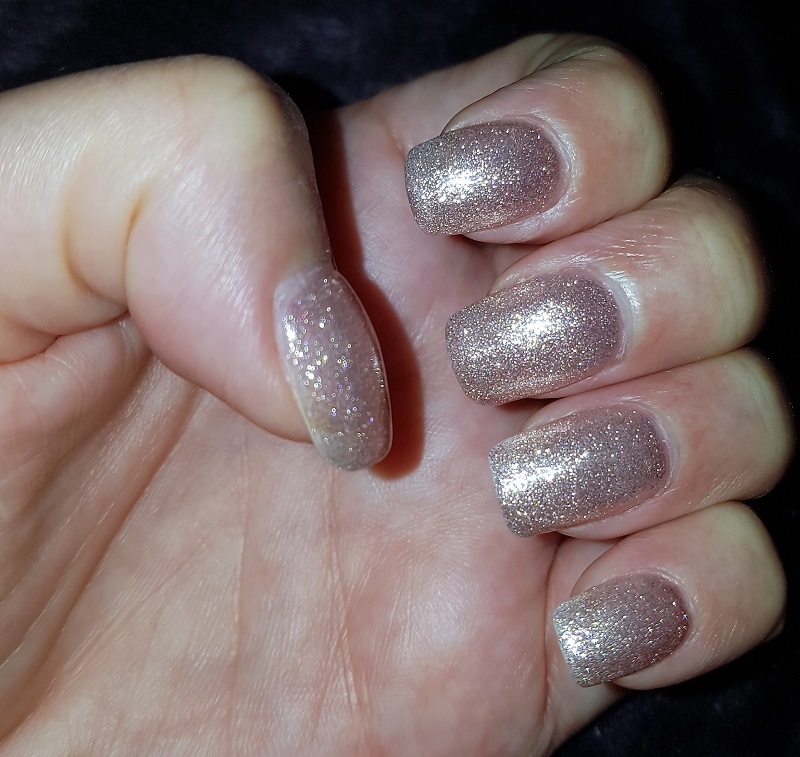 I’m mostly able to get 3-4 weeks out of most of my manicures and the current pedicure I have was done on the 30th of January – it is still going! There was one recent exception where my finger nails just went on a big growing spree and within two weeks needed to be redone, they had grown so much. I do get them cut right back each time because if I am leaving them for 4 weeks they will grow anywhere between 3-5mm during that time. 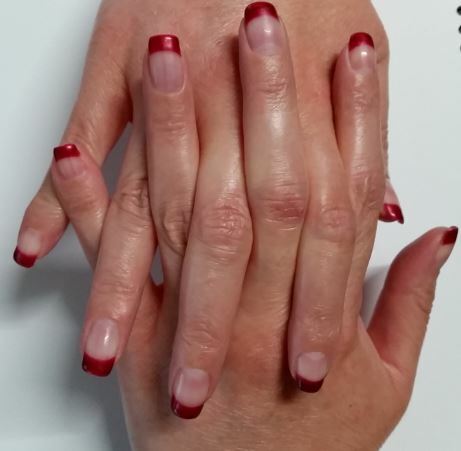 There is a new system for doing nails called the dip manicure which I might give a try soon. I’ll let you know how that goes!